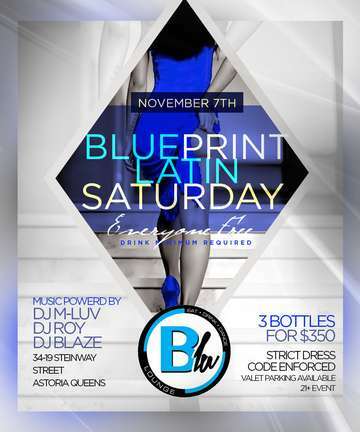 ExclusiveNites.com proudly invites you and your friends to the newest and hottest Saturday Night Party in Queens, Blu Print Latin Saturdays each and every Saturday night. New York City and Queens Hottest and best Saturday Night Party. Offering some of the best birthday and bottle packages in town! ExclusiveNites.com prides itself in offering our guest not only the most exclusive events inside New York City's top Clubs, Bars Lounges and Rooftops, but we also provide you with some of the best bottle packege deals in town! So come join us this and every Saturday night at Blu Lounge Astoria as we offer you the best bar and bottle deals in Astoria! We also have Hookahs available! Rooted in one of the original Lounge and Bar spaces in Astoria, Blu Lounge Astoria takes on the tradition of providing an innovative and a fun environment for the Astoria and Long Island City locals, both old and new. With the intimate ambiance of a lounge atmosphere and a Manhattan nightlife party vibe, Blu Lounge offers the best of both worlds and is a pleaser of crowds and couples alike. Space is limited every Saturday, so RSVP to ensure table service and special celebration bookings. Simply visit ExclusiveNites.com for info!